The Streamliner was the fifth in a series of Baby Bertha kit bashes that I did while building my Goonybird fleet. The first four kits were used to make four of the original Goonybirds from Estes but now it was time for somthing a little different. 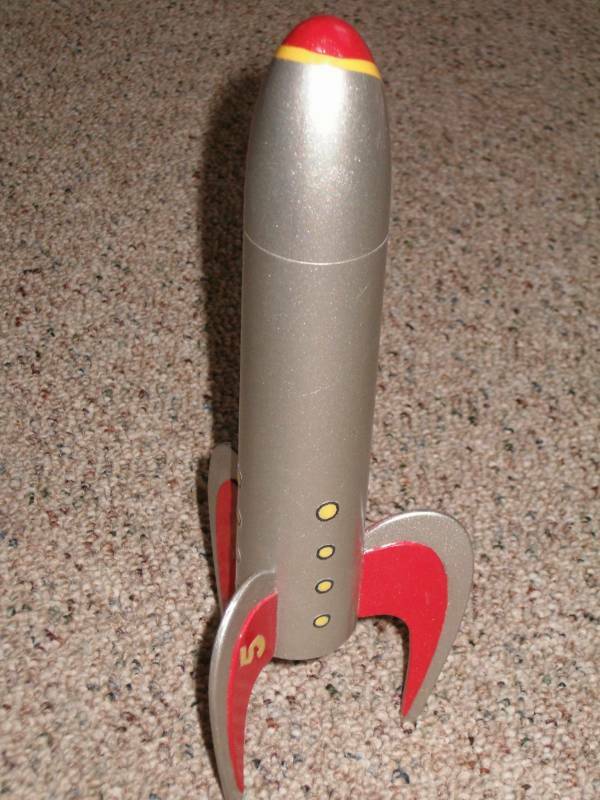 I remember seeing this model in a Design This Rocket contest and being a lover of retro rocket designs, I knew I wanted to build it and that I could do it with miminal fuss from a Baby Bertha kit. And so a Baby Bertha kit was purchased and construction began as per instructions with the motor mount. This is where the first change was made. I glued the mount flush with the end of the BT instead of receased as per instructions. This was done to make it look closer to the model. 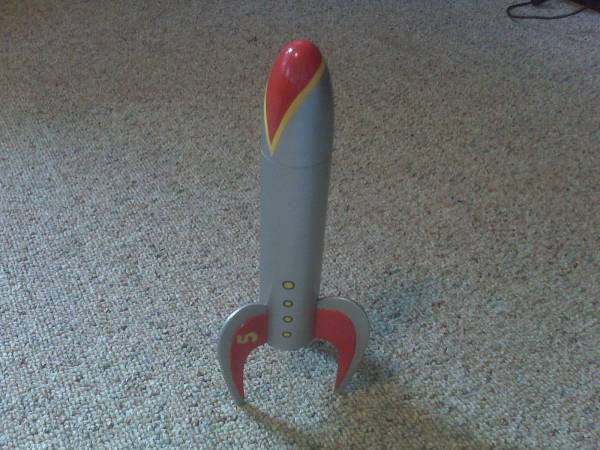 The fins were next and they were the main modification to this rocket. 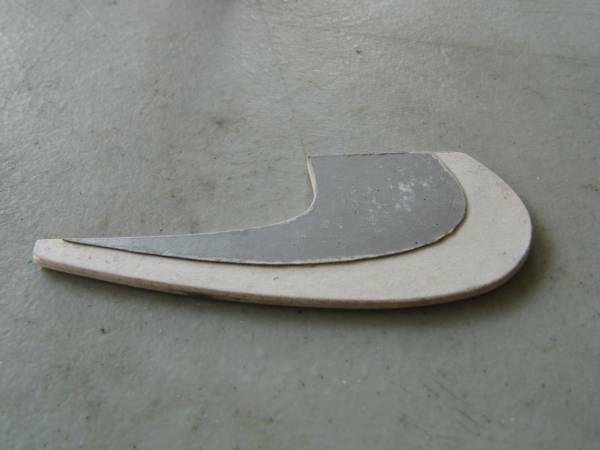 I started by printing out a picture of the Streamliner in order to get the basic design of the fins. From there I did some free hand sketching and enlarger and streched them some until I was happy with the size and look against the BT-60 tube. I then drew in the raised pieces and then cut-out both parts from the standard white printer paper I was using. 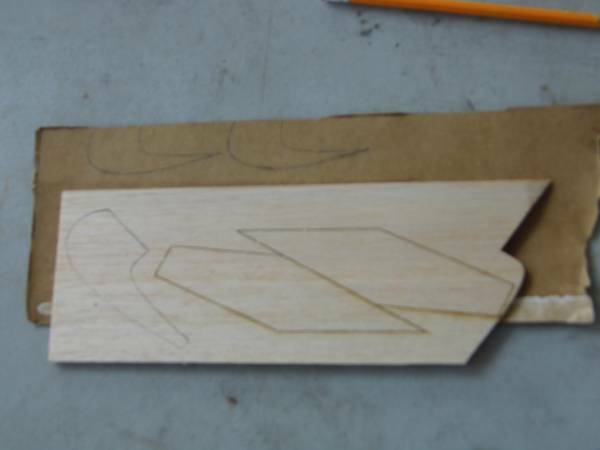 First I traced out the three main fin parts in the corners on the two balsa sheets that came with the Baby Bertha making sure the wood grain ran the right direction. 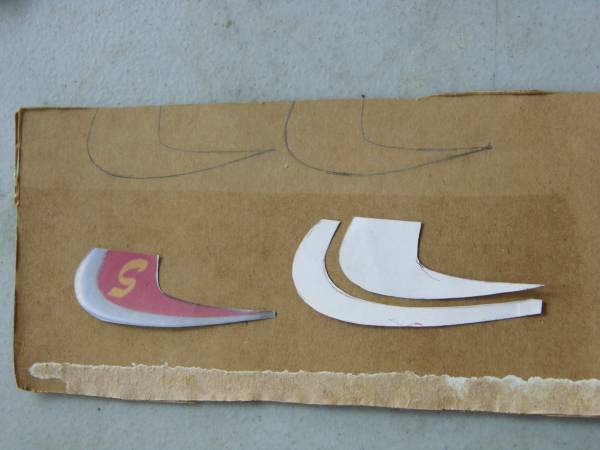 After they were cut out I took the patterns and cut out the raised section and traced it on the backside of a 12 pack soda pop box. I made six traceings, two for each fin. At this point I took the three balsa fins and covered them with white paper from the remaining sheet of paper that I cut the patterns from. 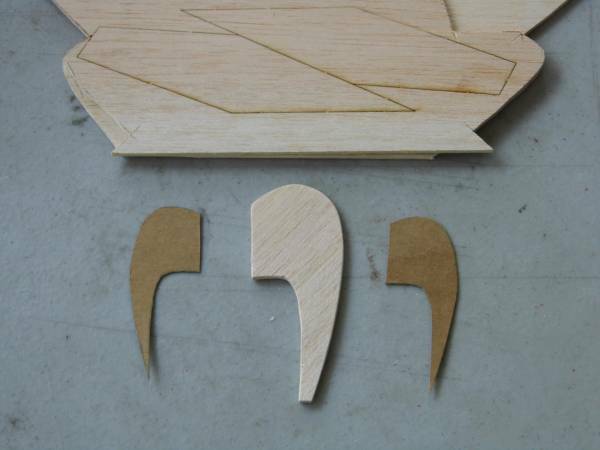 After these were dried and trimmed I then glued the cardboard raised fin pieces in place. While I was waiting on those I set about gluing the launch lug on. Once everything dried I then sanded all fin edges smooth. The root edges were sanded flat and taped off for primming. At this time I also marked where the fins went on the BT and cut 3 strips of 1/8" tape and applied them where the fins were to be mounted and then primed both BT and NC. The fins were then primed and sanded as well and after primer dried they were sprayed with Krylon Bright Red. The rockets BT and NC were then sprayed with Krylon Silver and all parts left out to dry over night. I started work on the decals next. Again I used standard white printer paper to print them out on after cleaning them up in Windows Paint first. The next day I took the fins and masked off what I wanted left red and sprayed them with the silver accent. After the paint dried for about an hour I removed all tape then stuck them to some doubled over tape by the root edges and gave them a day to cure. While that was going on I gave my attention to the nose cone. It was masked the way I wanted and the red paint applied. The NC was then set aside for the day to dry again before masking again for the yellow stripe. After the stripe was added the NC was clear coated and left to dry overnight. Back to the BT and fins. The fins were then removed from the tape as well as the tape strips from the BT. The fins were then super glued to the bear strips on the body tube. After glue dried I went back over all joints with white glue fillets and then put the rocket up for the night to dry. The next day the decals were trimmed and stuck on with a glue stick. After waiting for glue to cure, rocket got 1st of 2 coats of Krylon Clear to seal in decals. After allowing an hour to dry a final coat of Dupli-Color's Clear EFFEX was applied to give it that rainbow effect in the sunlight. The final step was to add 1/4oz. of clay to the NC to help balance it because I thought it felt a little tail heavy due to the MM being moved back and the added weight of the swept back fins. The string test verified this(more stable). The Streamliner was a fairly simple kit bash with the layering of the fins and paint job being the only real challanges. The paper and cardboard re-inforcing on the fins helps provide added strength for durable landings and to really add to its great looks. The painting of the Streamliner took some time to do but the end result was great. The only con is that I couldn't clean up the Streamliner's name in Windows Paint and I haven't found the right font to try and re-create it so it's missing its name on the side. Also upon futher examination of the original photo I realized that the yellow stripe runs down futher onto the BT from the NC but thats a minor detail and it still looks great the way it is. The maiden flight took place on Sept.15, 2009 at 2:37 pm and was text book perfect. 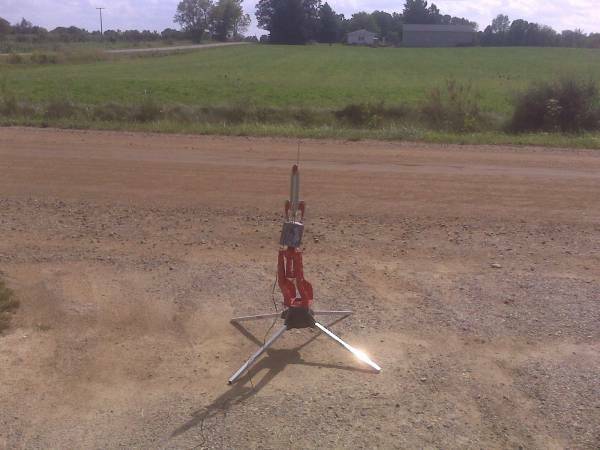 I loaded it with an Estes B6-4 and took it out to the pad at the end of my driveway. The launch count was given and the botton pushed and the rocket lept off the pad straight up with no spin or weaher cocking. Parachute was deployed just past apogee and rocket made a nice safe decent back to mother terra across the road in the neighbors field with no damage. This was a fun and simple kit bash to do and a great addition to my Goony fleet even though techniclly it's not a true Goonybird.